Tonatiuh, the Aztec Fifth Sun appears in the centre of this design which is based upon the Aztec Calendar or Sun Stone. 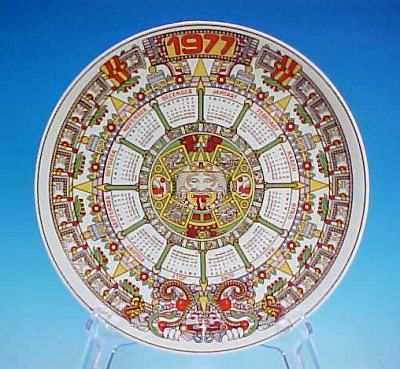 This Sun Stone represents the history of the world according to Aztec cosmology. This collectible Wedgwood plate or charger measures 10" in diameter and is in mint condition. No chips, cracks, crazing or repairs. Marked on the back with WEDGWOOD & BARLESTON OF ETRURIA logo and MADE IN ENGLAND. MSRP was originally $40.00.